Have you ever left a dad alone with a baby? Or told a dad to take responsibility of the little one, make sure its all dressed up, well fed, well slept? Well, then you would have a slight idea about what this post is about and if you don’t then let me tell you, you are in for a laugh riot. 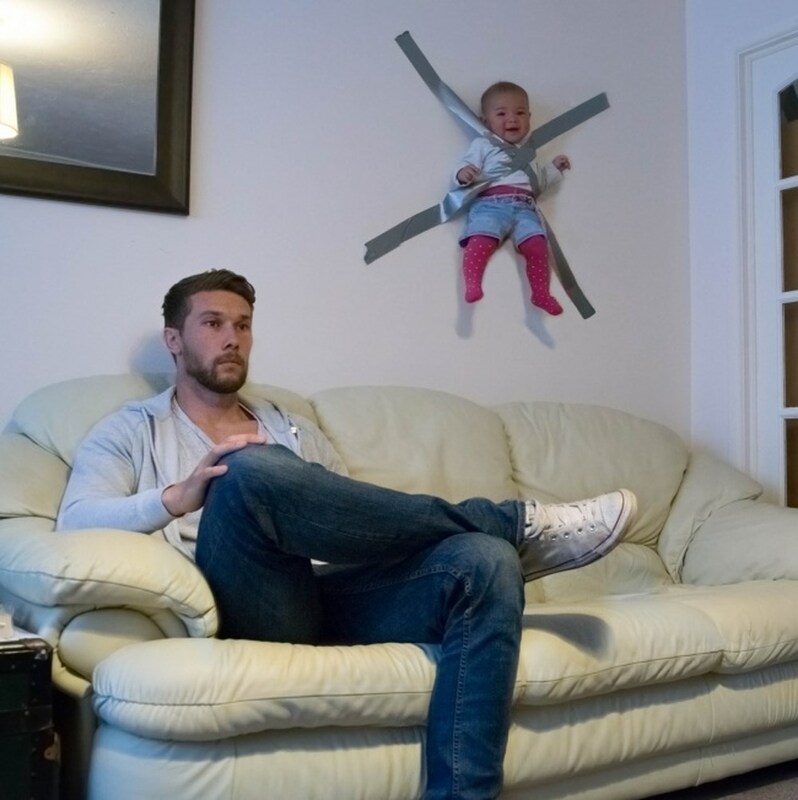 Dads get bored easily and they come up with the most interesting (dangerous) ways to take care of their little one and have their fun at the same time. These dads have made to the list because of the ways they have failed at (or totally nailed) parenting. This has got to belong to the nailed it category because the dad managed to reduce his headache by a lot. 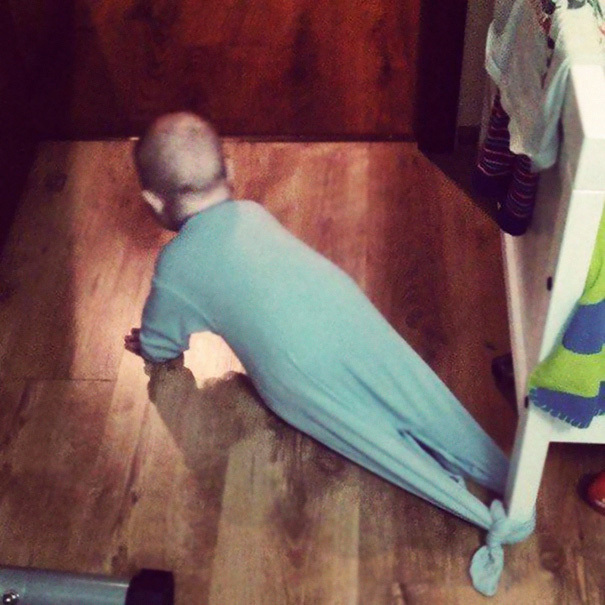 The baby can’t create a mess if it can’t crawl, and it can’t crawl if it is tied to the bed pole. Genius. This would definitely have exasperated the baby after a while and we just hope that it didn’t create a ruckus by crying. On another note, this seems to be the shortest and the most innovative leash in the history of leashes. 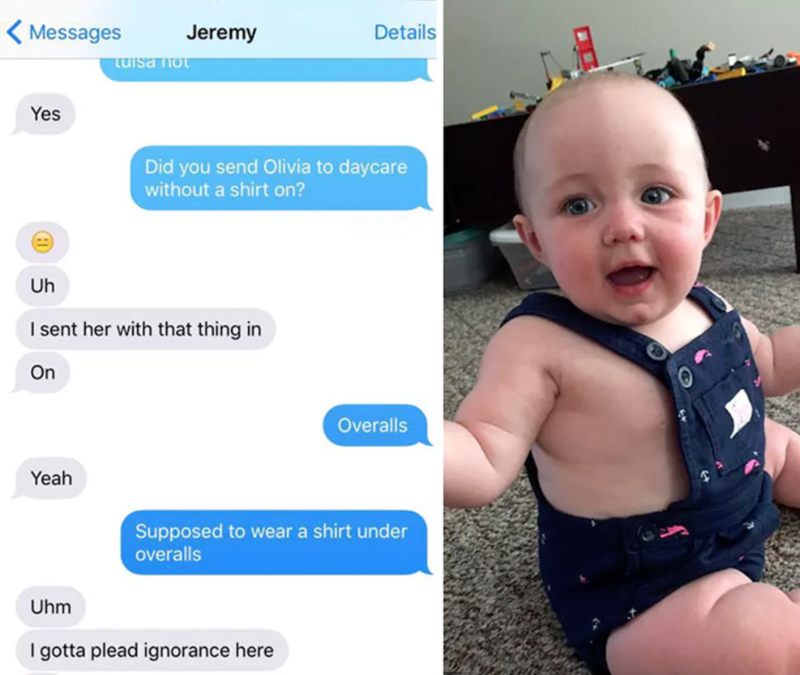 So Jeremy had one job; dress his little daughter Olivia and drop her to the daycare. Jeremy, as can be seen, is not really aware of the fact that kids are supposed to be wearing a shirt or a t-shirt under overalls. His messages convey it quite clearly. Question is can you forgive the dad for not knowing what goes under the overalls? In his defense, he didn’t even know what the hell overalls are. Fun fact about this picture: It became quite viral on the internet and even Ellen DeGeneres showed it on her daytime show and millions of people had a hearty laugh at Jeremy’s ignorance. One has to give it to the lazy dads. They come up with the most innovative ways of running from responsibilities and at the same time taking care of them. Who could have thought that one could make a ponytail with a vacuum cleaner!? And it is not half as bad as the pony made by the regular pony style. Even the girl seems to be impressed. You nailed it, dad. Dad was supposed to put his daughter on a fluffy bed and tuck her in with SHEETS where she could comfortably go to sleep. Instead, this dad let his daughter fall asleep on hardwood table, surrounded by toys which could easily hurt her if she makes the slightest movement. 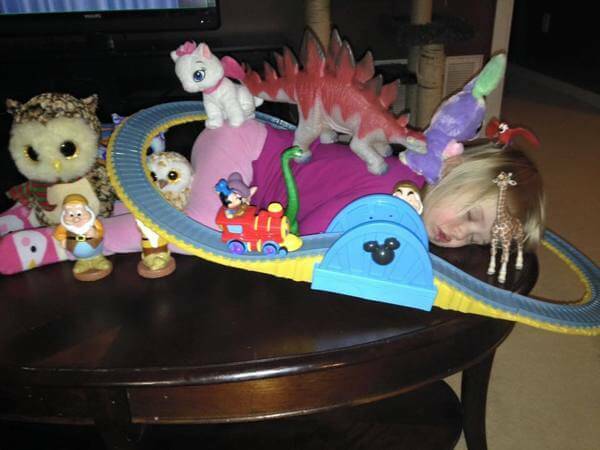 The way the toys are positioned it seems like this dad created this setup just to click a hilarious picture. But this could have gone wrong. Not funny, dad. Some parents make sure to read a bedtime story to their kids. It’s a healthy practice, not only does it makes the child go to sleep but also works up the imagination of the kid. Today mom told the dad to read a bedtime story to their kid as she was too tired. If she only knew that the kid was being scarred before age she would have never given the task to the dad. The baby was visibly confounded and surprised at these new illustrations in dad’s storybook which were so different from the stories mom told the baby. Wonder what story the dad was constructing. It does not take a scientist to know what is wrong with this image. 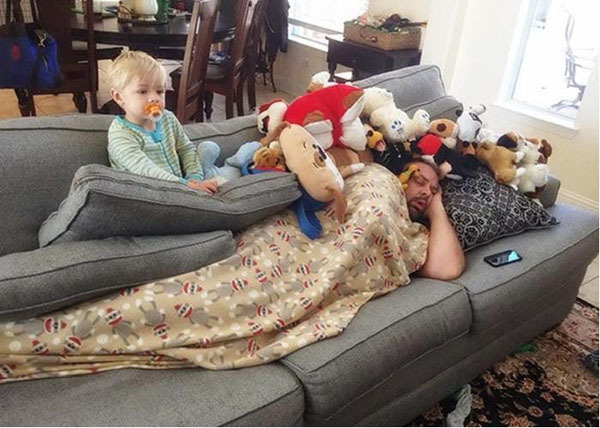 But parenting can be tough given what a mess children can create and this dad must have done a lot of running around with the kid and in his mind, he deserves a nap. He is literally sleeping the way he should have made his child sleep; all tucked in and with toys around. The child? The father has managed to keep him busy with the Television and kept him on silent mode (with the pacifier). Sarcastic. Annoying. Annoyed. English Literature Graduate, therefore universally acknowledged snob. Candies>Veggies. Milk>alcohol. Drama>drugs. Seinfeld>F.R.I.E.N.D.S. Fiction>Reality.